When we announced the birth of our little boy- who arrived eight weeks early- and the fact that we'd be in the NICU for at least several weeks, our people were incredibly supportive. Friends and family immediately asked what they could do, what we needed, what they could bring. And honestly, we had no idea. I mean, my little guy is in a great hospital, and they really provide just about everything. I decided that I'd stay with our baby as much as possible, which was easy to do in our NICU. The rooms had couches that folded into a bed, there were showers and laundry facilities available for families, we got meal vouchers that allowed us to eat in the cafeteria... and of course, everything our baby could possibly need was provided as well. But even though we had no idea what would be helpful, we did have several friends (and one very sweet former NICU mom who I actually didn't know at all) who gave us things that were amazing and made the journey so much easier. 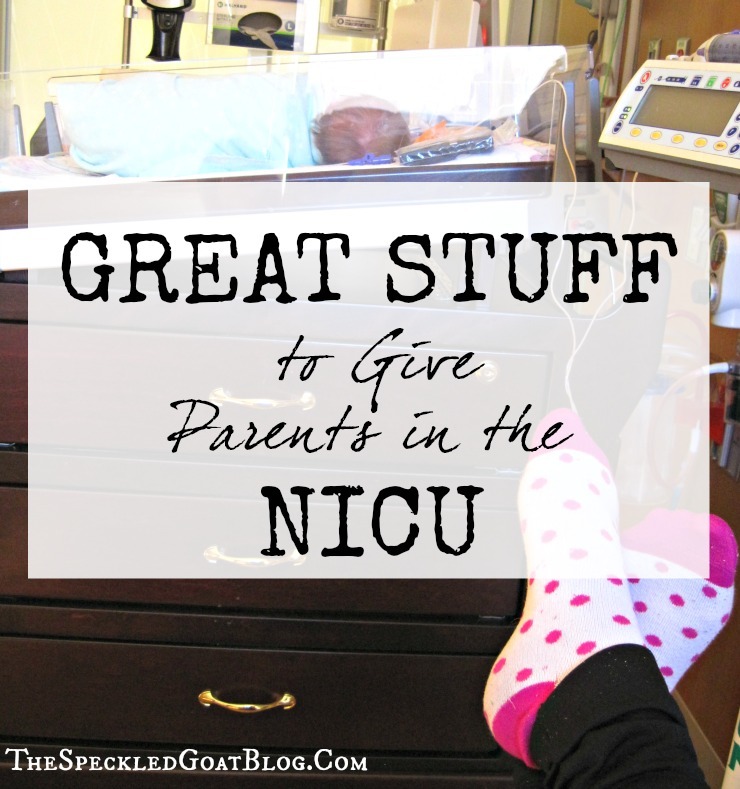 While I can't take credit for any of these ideas (since they are all things that were given to me), here were a few of my recommendations of gifts to give a family with a baby in the NICU. This thing was life changing. Seriously. It was given to me by a total stranger - a former NICU mom who I actually met in a Facebook group - and it was amazing. My little guy couldn't breast or bottle feed right away, since he was so early, so I pumped exclusively for weeks so he could be fed mama milk through his feeding tube. The NICU nurses called breastmilk "the first medicine," and really encouraged feeding breastmilk to help my baby's immune system, and since I planned on breastfeeding eventually anyway, establishing a supply was important to me. Pumping wasn't terrible... but it was annoying, time consuming, and frankly a little boring. It made such a difference to be able to do something else while pumping-- usually I scrolled through Facebook or googled stuff about ways to help my baby grow. It made the time go so much faster, and the little bit of distraction actually usually helped my supply. Love this thing. Hand washing is a huge deal in the NICU- no surprise there. Between my own little one's premature immune system and lots of other babies who were dealing with infections or recovering from surgeries, keeping germs out was so important. After a couple of weeks of rigorous hand washing and hand sanitizing, my skin had about had it. My knuckles started cracking and my hands got rough and dry. I loved having hand lotion right there in my room- I'd wash my hands on the way to the NICU, use hand sanitizer at the door to our room, and then lotion up to protect my poor hands. Unscented is the best bet, because little babies are so sensitive to smell- especially preemies. Okay, so the hospital did provide blankets for parents who were sleeping in the room (and sheets and towels, too), but when my small group ladies gave me a cute blanket, it really made all the difference. 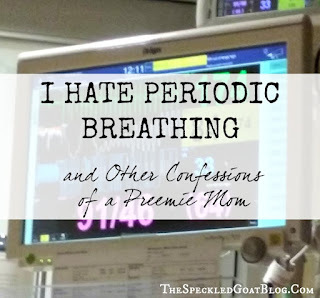 While I wasn't uncomfortable in the NICU, it still didn't feel like home. Having a couple of things that didn't belong to the hospital - like a cute blanket for my bed - made it feel much more cozy in our room. On the same note, having some things of ours specifically for the baby made a big difference, too. While the hospital did have lots of crib sheets and blankets and swaddles for our little guy, they weren't "ours." This was another gift given by the former NICU mama- she said that she used the blankets as crib sheets and swaddles and it made her feel more like her baby was her baby instead of belonging to the hospital. I totally get that. Anything to make it feel more like home! We used these a lot. Since all of my baby clothes stock was sitting in boxes on the living room floor, I didn't have much for baby clothes ready and available for our little guy... and most of the clothes we had wouldn't fit him yet anyway (since we purchased more 3-6 month stuff and bigger). A cute sleeper- either preemie sized or newborn sized- had the same effect as the blankets. It made me feel good to have some clothes of his own to put him in instead of just NICU clothes. Make sure you get the ones with snaps, not zippers, because of the monitor wires. My mother-in-law bought us this calendar (there are a whole bunch of different colors and styles of it, too)- and I really loved it because honestly, NICU days really start to run together. With a calendar, I wasn't too pressured to write a lot down or take a lot of time recording things, but instead I would make quick notes about milestones reached, or people who came to visit, or cute things that our baby was doing that day. Gas Gift Cards- especially if the NICU isn't local, gas gift cards could be really helpful for a family going back and forth a lot. Travel Sized Hand Sanitizer- anytime I went anywhere outside of the NICU, I was certain that I was picking up all the terrible germs. Having a little bottle of sanitizer in my purse made me feel a little bit better about touching door handles or shopping carts. Freezer Meals- while all our food needs were taken care of while we were in the hospital, having a baby two months early meant that a lot of the things I'd planned on prepping at home were no where near ready. I thought I'd have months to prepare frozen meals for when we brought baby home... but nope. Make a couple freezer meals for when the baby comes home and the new family is trying to adjust to life outside the NICU. Snacks- hospital cafeteria food wasn't too bad, but it does get tired after a while. It was nice to have a little variety in snack form- especially treats! Cookies, bars, granola, candy... all good choices. We were so blessed by the many many people who showed us how much they care about us by bringing us stuff-- but also know that just a supportive text or a quick visit makes such a difference, too. All theses gifts were so wonderful, but even more wonderful was the love that we felt from our friends and family-- and for that we'll always be grateful!